Loft Kitchens for The New Loft. Do they need to be a different kind of kitchen? The expansive but humble, artist’s work/live loft that has evolved from its industrial debut in New York’s Soho district is now the ultimate ‘right’ place to live. As many of our more sensible citizens re-discover the advantages of living closer to work and cultural amenities, their dwelling of choice has increasingly become the New (not-so-humble) Loft. Either in restored older structures or in new construction, the New Loft with its smaller but still wide open floor plan, high ceilings, tall windows and exposed structure is highly coveted, especially to the move-up urban residents desiring to escape their cramped, light starved apartments. Many New Lofts feature unadorned industrial materials for the finishes such as concrete, brick, rustic woods and metals. This simplistic honesty creates a bright canvas that allows the new occupants to fashion their own personal style. The New loft is even finding its way out of town. Its character is a strong enough lure for people who don’t need large properties anymore, but also don’t want urban excitement. Futurist trend spotters know that smaller homes with open-plan multi-functional living areas are needed to replace the cookie-cutter, small and large-lot McMansions and their many separate, single function rooms. Essentially, the wide open, light filled character of the New Loft is predicted to be the model for new homes wherever they are planted. Though the New Lofts have wonderful characteristics, some of these very same features have inherent problems. The many tall windows increase the need for light and privacy controls. The open areas with hard materials on all surfaces tend to be noisy. 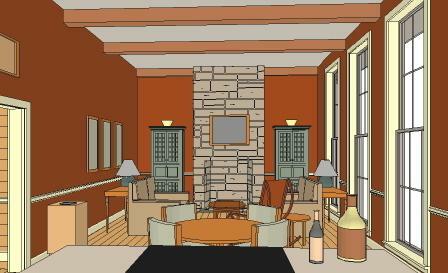 Privacy between the sleeping and living areas is a problem for all but single residents. 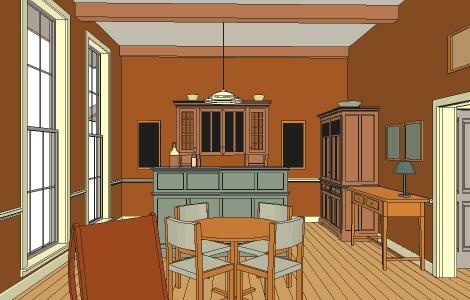 And exposed, built-in kitchens often compromise the visual character of the room. 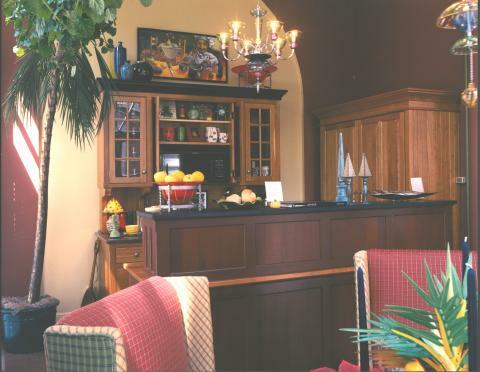 Standard kitchens are oriented horizontally, with their continuous runs of counter tops, base and top cabinets, with decorative back splashes separating the cabinets. Appliances are either exposed stainless steel, or some of them are concealed in the cabinetry. These kitchens can be quite striking, i.e. go to www.trendir.com and click on the kitchens link to see some wonderful (but very high-end) modern examples. Some are more traditional. But are these horizontally oriented kitchens the most appropriate for tall open spaces? Do they blend with the personality of the rest of the room? Do we really want to see the mess in the kitchen all the time? An alternative is to use a kitchen concept that is oriented vertically, which is how the other rooms in most homes are arranged. Typically, doors, windows, fireplaces etc. are all vertical elements that are separated by vertical wall spaces. Furniture is placed in these wall spaces. Then furniture is floated like islands in the middle of the room. Furnished loft kitchens work the same way. First, a beautiful room is created. Then it is furnished. And that’s why YesterTec created Kitchen Workstation Furniture, an extensive line of super-efficient, appliance concealing, independent pieces of furniture, designed from the ground up for tough kitchen use. Because they are so efficient it only takes a few workstations to create a fully functioning kitchen that blends like never before into the rest of the room. Again, create a room, then furnish it, it is as simple as that! YesterTec’s U.L Listed workstations can even conceal the ‘hot’ appliances like ovens and cooktops, so that the beauty of each piece is preserved when it is not being used. Small appliances and ‘Clutter’ are concealed in Working Pantries. Refrigerators, ovens and food storage are incorporated into Armoires. Raised storage/counter tops behind the sink or cooktop Islands (the floating furniture) conceal the messy counter tops from the rest of the room. 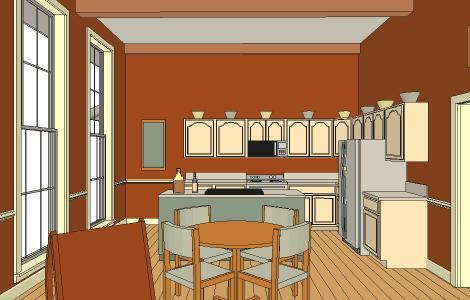 Note: The three drawings above were created using YesterTec’s design program that allows clients to see their kitchen from any angle before it is ordered. The photo above is the ‘as-built’ design that was modeled in the drawing above it. Often, a New Loft’s front door is right next to the kitchen area. Many times, loft kitchens are not just completely open to the rest of the room, but they are in the middle of the traffic pattern! This is why hiding the appliances in beautiful pieces of furniture is so appealing. We are not always cooking. Many urbanites rarely cook with all the restaurant and take-out opportunities so close by. So why must we always be looking at exposed appliances and messy kitchens? 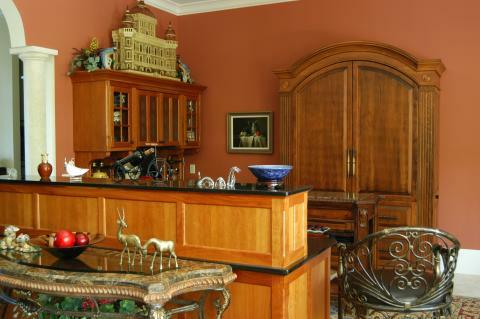 Here the refrigerator, 2 ovens and a full height pantry are concealed in the green armoire. An extra piece (one of our Storage Units) sitting on the countertop conceals the cooktop and sink. For smaller lofts, better known as Efficiencies or Studios, YesterTec even makes a one piece Mini-Kitchen Armoire that conceals a complete mini-kitchen. The following photos show just a couple of examples of how the simplistic nature of workstations can be so appropriate for loft design. A black sink island workstation conceals the messy countertop around the sink and even part of the range’s countertop from view from the living area of this industrial loft. Note the different heights of the two workstations that are against the wall. It is often desirable to style a particular workstation to be the dominant focal point. 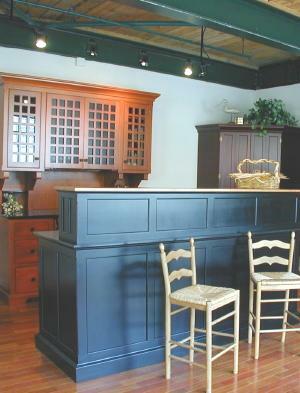 If every piece of furniture is the the same size, the design is less successful. The spaces around each workstation allow the colors and door styles to be different as well! This kitchen is in the middle of three separate living areas in this large oceanfront loft-like condominium. 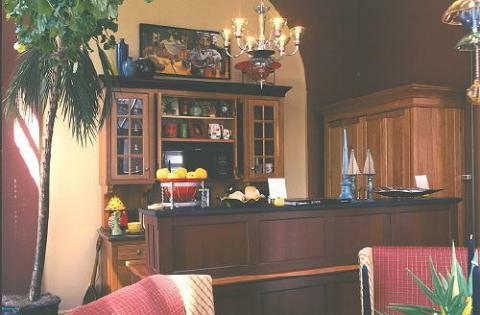 All the living areas are quite formal, so the idea of hiding the appliances is very appealing. The arch top piece is the refrigerator/pantry. The wall piece to the left is a complete range and again, the storage piece above the sink island’s work surface conceals the messy countertop. Theoretically, a New Loft could be sold without a kitchen, and the new owners could just select workstations of their choice to blend into the room. Workstations can even be moved to the owners’ next home! Whenever an open plan room needs to include a kitchen, whether it is a light and airy Loft or a 1960’s ranch house renovation, Kitchen Workstation Furniture should be considered. 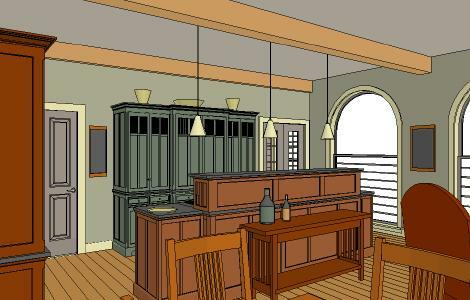 The design process is fun and easy, but most of all, it is rewarding to know that you can create a wonderful live-in kitchen simply by placing furniture instead of installing cabinetry!